This is a reprint of an article I wrote a couple years back concerning the Milliner Drydock(s). There isn't much left of the later dock, although it can be seen on the corner of Conquest Rd (Rt 38) and Dock Street. Basically it was north of where Ed and Jeans Market is today. If I were to ask you, “What drydock(s) were in Port Byron?” you might answer “Tanners”. Tanner’s large drydock, located across from the Erie House, was the often photographed and written about operation. But Tanner’s operation came about late in the life of the enlarged Erie Canal. It began operation under the King name soon after the canal route was changed in 1858, and was closed by the abandonment of the canal in 1917. But we need to go back much further in time to get a full answer to the question, for in 1823 David Johnson purchased land from Aholiah Buck and built a drydock along the route of the new canal. It does appear that Buck knew that Johnson wished to construct a drydock, for the deed makes stipulations that only a business was to be built, and no privy or house was to be built. We also learn that Buck had fruit trees planted just north of this lot, as he writes in the condition that the trees would not be harmed in the building of the dry dock. To find this drydock today, we would need to dig in David Nielens yard, or between River and Canal Streets. Standing at the junction of River Street and Moore Place, the old canal ran off to the west toward Ed and Jeans parking lot and to the east on a line toward St. John’s Church. Although Ed and Jean lot is built on many feet of fill, the area just to the east appears to be at historic elevations. In the 1830’s map below, the road just to the right of the word “Byron” is Canal Street. The dry dock can be seen above the canal. This dry dock was purchased by George Washington Millener, John Davis and Joseph Duram. Millener’s father was Alexander Millener, a drummer for George Washington during the Revolutionary War. (You might recall the Millener family was in the news a few years ago as the Cayuga Museum wanted to sell a painting of Mrs. Millener and child. The painting was done by Sheldon Peck.) Alexander was a visitor to Port Byron as two of his sons, George and James, lived here and another, Joel, married a woman from here. Joel owned a large dry dock business in Rochester. In the 1850’s, Joel and George ran a large, but temporary, boat building business in Syracuse, as they built boats for a coal company in Pennsylvania. The deed books are peppered with purchases and sales of shares in this business. At any one time, George Millener had at least one partner and often two or three. Either the boat building business was very profitable or, more likely, not so profitable, or extra cash was needed to keep things going. Lorenzo Ames began working at this business in 1834 as a sixteen year old. He would later purchase a dry dock from Millener, but not this one. When the route of the canal was changed in the late 1850’s, George lost his business. But instead of giving up, he moved the business to the corner of Canal Street and a new road, East Dock Street. Apparently, this dry dock was not legal, as Richard King, the builder of a new dry dock near Lock 52, wrote letters concerning its construction to the Canal Commissioners, but to little satisfaction. 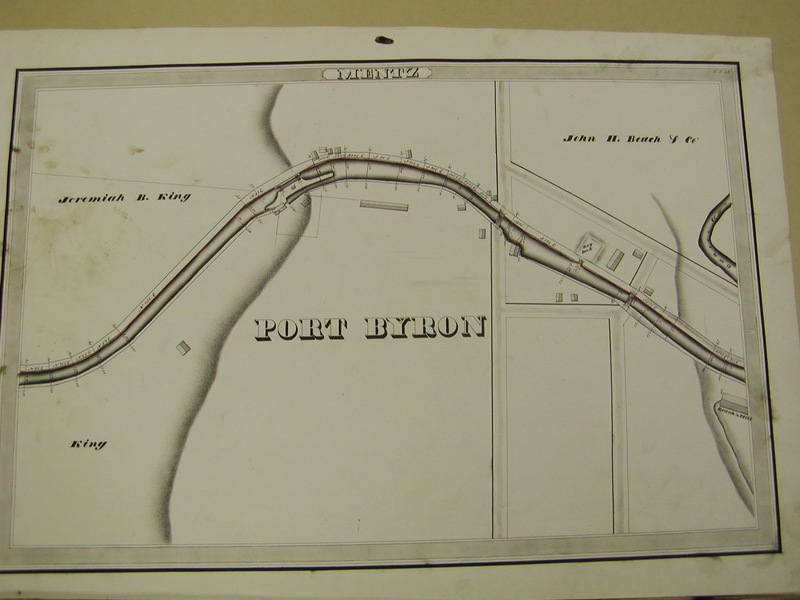 So for a time, Port Byron had the King dry dock, the Millener dry dock and a small slide dock run by Ames. In 1861, Lornezo Ames purchased a quarter share of the Millener business, closing down his slide dock. In 1873, Ames and a Chester Cole purchased Millener’s share. This partnership was not to last, as by the end of 1873, Cole sold his share to Ames. In 1879, the paper reported that Millener had to repurchase a half share of the business to save it from foreclosure. In 1880, Ames, once again the sole owner, sold the business to Tanner and Shetler, who closed it down and concentrated on the “famous” Tanner dry dock we all know about. Parts of the second Millener dry dock can still be seen in the yard of house that sits on the corner of Canal and East Dock. Also the ditch that runs along East Dock was used by the dry dock to drain the dock into the Owasco Outlet.